In the summer of 2003, one of my close childhood friends and next door neighbor, Jeremiah Hamlett, from Phenix, Virginia, was diagnosed with terminal brain cancer. The night I received word of his diagnosis, I went over to the basketball court across the street from my house and Jeremiah’s and sat in my car with a green notebook pressed against the steering wheel of my car, and began writing. This is the story of our childhood growing up in small town America. This is the story of life and friendship in the face of cancer. This is When the Lights Go Out at 10:16, A Memoir. In the late 1980’s and early 1990’s, the basketball court in Phenix was always jammed pack, particularly on Sunday. Pick-up trucks and cars lined the hillside and there was overflow parking in the tiny football field up next to the road on the corner of Church Street and Charlotte. To call this patch of grass a “football field” is a bit of an overstatement, but when you’re a kid and of small stature in comparison to the running, jumping adults in the near distance, what was perhaps twenty five yards long felt one hundred yards and the equivalent of playing at Lambeau Field. Blue jeans and flannel shirts and ratty white Reeboks adorned bodies that twisted in mid-air for a lay-up or a rebound ricocheted off the rim. Young women in short shorts and sundresses laid on the hillside and watched their boyfriends or young husbands. Inside Robbie Canada’s pick-up truck parked behind the near-end hoop, the NASCAR race blasted through the stereo’s speakers. When it came to the basketball court in Phenix, the names Richard Petty and Darrell Waltrip were more revered than that of Michael Jordan or Larry Bird on Sunday afternoon. And, if ever there was a serious pile-up on turn whatever at the Darlington 500, a stoppage in play would ensue on the basketball court in Phenix hundreds of miles away until the debris was clear and the pace car returned to its rightful place on the sidelines, engines revved up, a new leader out front. In Phenix, though we had a full-court to play on, we played half-court. On Sunday afternoons, both sides of the court featured games due to the sheer number of people that came out. All other days, the far end of the court nearest the pool hill was the predominant side played on — large oak trees and grazing cows from Bobby Canada’s cow pasture the background in the immediate distance. Four-on-four was customary, but three-on-three would do if Sunday attendance was limited. On very rare occasions would a full-court game be played. Just as with any true basketball game, if you scored a point, the other team received the ball in return. “Make it, Take It,” was not the standard format in Phenix. “Keysville Rules” we called “Make It, Take It.” If you want to play “Make It, Take It,” go to Keysville. Otherwise, score on offense, and then ready yourself to play defense. All games were played to fifty, win by four. Winner stays on, loser tucks his tail while a new team comes on in an attempt to dethrone the champ. There was no three point line until the mid-1990’s when Jeremiah took a line of string and a can of white spray paint from his dad’s garage and sprayed one on one fateful Saturday morning. Thankfully, because the line looked like it was professionally done, Dexter Andrews, chief party responsible for the maintenance of Phenix Recreation Association, didn’t give us any grief about the spray paint. And while the adults dominated the landscape each and every Sunday, it was us kids who dominated the blacktop the remaining days of the week; basketball was the predominant game, but there, too, we recreated NASCAR races on our bicycles using the court as a speedway and tackle basketball on the snow covered blacktop in the winter. It is where other games of our own creation were played, such as the classic Phenix sport of tennis ball. Tennis ball was a simple game — essentially baseball without a baseball, replaced with a tennis ball, which you had permission to beam at your friends’ head or body as he rounded the bases after cracking the ball toward Phenix Methodist. 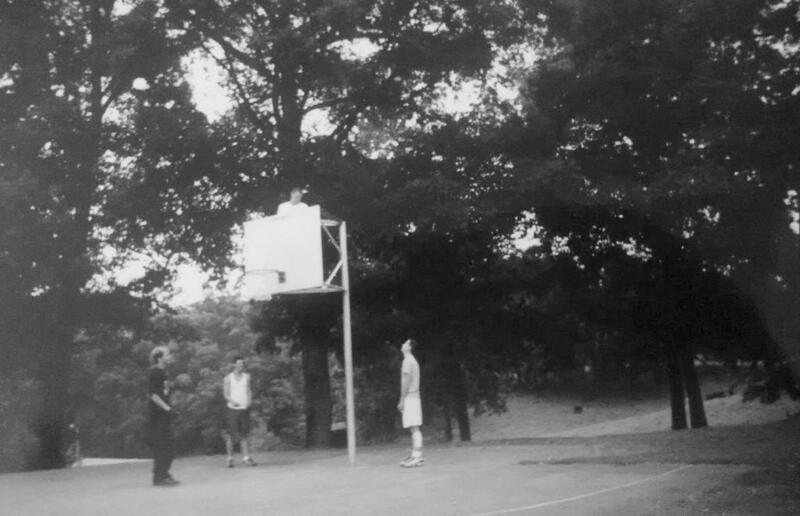 The basketball court was where punches were thrown and lifelong friendships and memories were born. In short, the basketball court in Phenix (or simply the court, as us kids called it) was our home away from home — a sanctuary of youth. Here’s to not forgetting; or worse, never knowing who those kids were in the first place. I’m not sure if Brandon ever realized how much he could glide through the air. Had he wanted, he could have legitimately played on the high school basketball team. He could take intense contact and still finish against bigger, stronger players. The whole leading with my knee while in air part of my game resulted in more than one dust-up with my cousin Robbie who often was the recipient of my knee in his chest. The “milkshake shot” so named because Michael had bought a milkshake from B&D Mart before coming to play, sat it at half-court during a game, only for the ball to bounce back toward his milkshake on the court, thus knocking it over. Pissed, Michael slung the milkshake covered basketball up toward the rim and made it. Then yelled, “Milkshake, baby! I enjoyed this one, Jeff, as I do all of your writing. Your heart, soul, and passion, comes through loud and clear. I appreciate your kind words, Brenda. Thank you for stopping by.